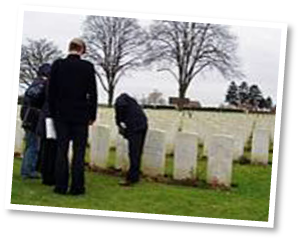 If none of the scheduled battlefield tours that we offer are what you are looking for then we at Rifleman Tours can arrange a tour customised to suit yourself or your group. You have complete control over the construction of the itinerary, transport and accommodation. Private and customised tours are ideally suited for groups and those who wish to engage upon a personal pilgrimage. The tour is planned and composed based on the wishes of the group or private travellers. This determines the sites to be visited, the transport used and the accommodation. Rifleman Tours can cater for groups of 10 to 50 people or larger. We can provide a tailor-made tour specifically designed to meet your group’s every requirement. By working closely with you, Rifleman Tours can construct an itinerary, arrange accommodation and transport all entirely to suit your agenda. 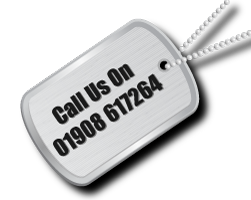 Whether you are Military unit or association, society or even a Royal British Legion branch we can supply a tour that can suit your every need. 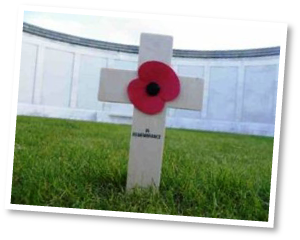 If you would prefer a small personalised private tour of a battlefield of your choice then Rifleman Tours can cater for this. From an individual to a party of four we will be happy to put together a draft itinerary along with provisional costs. We will work closely with you to construct the tour to meet your requirements exactly. Once all has been agreed and approved we will then submit a full comprehensive agenda with definite prices. We selected Rifleman Tours because they were the most efficient in responding to us and creating our own tour. My Grandfather was captured at the Battle of Cambrai in 1918 having signed up the year before at the age of 40! So we wanted to understand the context of the WW1 and find where he had fought and been captured. Tony picked us up from home and spent the week with us driving round the various battlefields and cemeteries in what was an exceptionally interesting and fascinating tour. We ended up at the Flesquieres Salient where he was captured and had the privilege of seeing one of the tanks used in the Battle of Cambrai which a local hotelier had dug up !! Tony was extremely knowledgeable and at every cemetery he was able to choose one or two graves and explain something about that individual. A really great experience and I thoroughly recommend Tony. 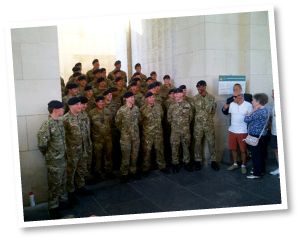 On behalf of 16th Signal Regiment and 230 (Malaya) Signal Squadron I would like to thank Tony for his excellent battlefield tour of Ypres Salient and of The Somme. From the very first piece of communication to the final farewell in Ypres, Tony’s service was first class. As for the tour, Tony put together a highly polished and professional bespoke package for 40 members of my team, and continued to dazzle them all with the romance of his stories and the passion that he harnesses for military history. Thank you Tony and best wishes for the future. Dear Tony and Allison. 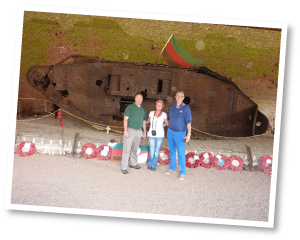 Following our recent battlefield tour of Normandy and the D-Day beaches with Rifleman Tours, we all want to thank you both for accommodating our needs so well. As members of the Royal Green Jackets Association (Milton Keynes Branch), the Normandy area holds particular relevance to us and you tailored the tour to include specific areas of interest, including laying wreaths at the bust of Major John Howard, on the original Pegasus Bridge and at the grave of Lt Den Brotheridge in Ranville. Your knowledge of the area is second to none and both members and their partners came away with a deeper insight of those first hours of D-Day. Mersea Island Branch RBL 3 Day tour 2017 Tony’s professionalism whilst enquiring and confirming tour details, from being picked up to being dropped off at our branch premises could not be faulted. During the tour of the battlefields and monuments, Tony’s knowledge of the battles and of the individual characters whose actions won the day or Victoria Cross was outstanding. Tony’s attention to detail and passion to engage with us made the tour all the more interesting for us. All those who took part in the tour had nothing but praise for Tony and his friendly way. I can without hesitation recommend Tony and Rifleman Tours.